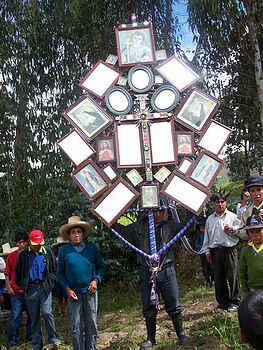 Crosses of Porcon or Cruces de Porcon is a traditional Easter week festival organized in Peruvian town of Granja Porcon, Cajamarca Region. The main day of this festival is Palm Sunday. Four different ceremonies are organized then. First one, the crowning of the crosses. The second one, the greeting of the Lord at the home of the mayordomo (the „boss“ who organizes the whole festival). The third one, the various responses sung in Quechua and Latin. And the fourth one, the procession to the plantation chapel. Let's now describe what makes this festival quite unique. People decorate crosses with mirrors, symbolizing the souls of the dead, pictures of Virgin Mary, Heart of Jesus and patron saints. Everything forms a huge rhomboid. The hanged metal bells announce the arrival of the crosses to the village. Leading the procession there are angels dressed out in turquoise, yellow and pink hanged onto the señorca, the donkey symbolizing the triumphal entrance of Jesus in Jerusalem.